on the woodside. : *sandwich story. 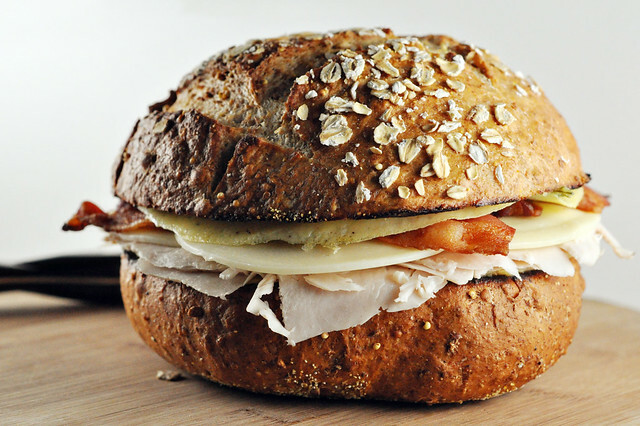 To my mind, there aren't many things that fill, comfort, and satisfy quite like a sandwich. There's the ohskrewit-ness of eating with your hands, the infinite possibilities for ingredients, and the textural coup that's almost impossible to achieve with anything else. The genius is in the simplicity of the formula: 2 pieces [carbohydrate of choice] plus whatever you want. When I'm planning to feed any group of unknowns—a crowd, strangers, anyone with dietary constraints, picky picky picky people—I almost always default to the sandwich. I like a certain rawness to my sandwiches—I'm less attached to toasted bread and melty cheese, although of course there is absolutely nothing wrong with either. There is just something devil-may-care about eating with your hands, biting into something that's a perfect package of all your favorite things. This one, actually, isn't my favorite. It comes courtesy of Giada de Laurentiis, and I love it because of its unexpected inclusion of egg crepes. (Stay with me.) She serves these on focaccia, and I think they would have been vastly improved by it if my grocer only carried it. I settled for a seeded Italian bread; the flavor was nice, but it was too densely chewy and tough. Also, she calls them "Mini Italian Club Sandwiches"—she's marketing them as appetizers—but they lack a few of the things I love best about club sandwiches, namely lettuce and tomato. I used reduced-fat pesto here, but it was doomed from the start: Pesto has a delicate flavor that is probably nice with the Giada's choice of bread, and the reduced-fatness would likely have passed by unnoticed, but in this case it never had a chance. The taste was sucker-punched by the bread, and in the end it wound up playing an almost invisible role. The egg crepes are easy, and worth it. It helps to have a little extra egg at the ready so that you can try one or two to determine how your stovetop idiosyncrasies are going to affect the outcome. Don't let them brown; soft and creamy is the way to go. They add a lovely, unexpected layer of texture that makes even an addict like me forget there's no mayonnaise. They're also beautifully elegant and will make people eyeball you as though you are a kitchen genius, so ... there's that. Or just slap everything in your pantry and refrigerator between two pieces of bread for instant happiness. 1. Preheat oven to 425. Place bacon on a foil-lined sheet pan, and bake until browned and crispy. Set aside. 2. Whisk together eggs, cream, salt, and pepper until well blended. Heat a 6-inch nonstick skillet over medium-low heat. Brush the skillet with some butter. Pour enough egg mixture into the pan to just coat the bottom of the pan, swirling to distribute evenly. Cover and cook 2 minutes or until egg crepe is just set. Invert a plate over the skillet and turn the skillet over, allowing the egg crepe to drop onto the plate. Repeat to make 4 crepes total, brushing the skillet with melted butter as needed between crepes. 3. Cut the focaccia in half horizontally, and place directly on oven rack in center of oven until lightly toasted. 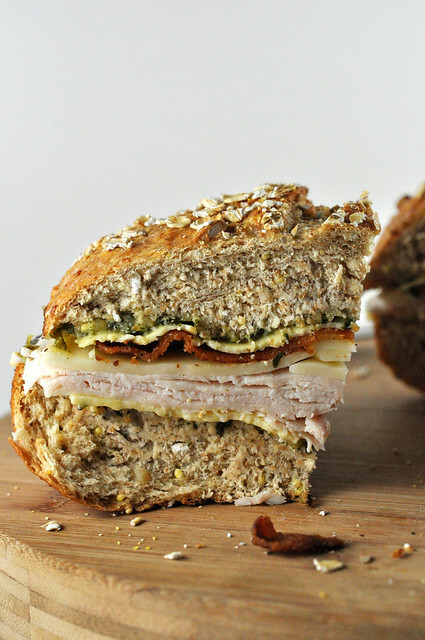 Spread pesto over the toasted sides of each halved focaccia. Divide the egg crepes, turkey, provolone, and bacon equally among two pieces of focaccia; top with remaining two pieces of bread. Cut each sandwich into bite-size pieces. Makes 6 servings. Love the post (as always), but I'm dubious of Gee-AH-da's non-usage of banana peppers or pepperoncinis. I'm partial. pepperoncinis are only used for SPECIAL sandwiches.